I visited Death Valley 7-9 February 2005. Since this was a vacation trip with my non-botanist family, I did not do any intensive botanizing. Hence these observations are all "drive-by" botanizing, and are quite incomplete in terms of the species that actually exist in most of the locations I visited. Furthermore, because I did not carefully key out each species I saw, some of the species are not fully identified, and it is possible that some of the species names are wrong. I would appreciate any corrections from anyone with more careful observations. On 7 February 2005, we drove from Fallbrook, North San Diego County, to Furnace Creek Ranch via I-15 to Baker, SR127 to just past Shoshone, SR178 to Ashford Junction, and then Badwater Road to Furnace Creek Ranch. We stopped at the lush wildflower display in Walker Canyon (Lake Street exit between Corona and Lake Elsinore), but the California poppies were closed due to the light mist. I-15 from Temecula to Corona had a number of popcorn flower displays producing large patches of white. We had heavy fog coming out of Cajon Pass, and the Mojave Desert portion of the trip was in mostly-cloudy weather. I was surprised that for the most part, at least from high-speed travel, the only green from annuals showing in the Mojave desert along I-15 were (probable non-native) plants under creosote bushes, and the invasive non-native weed Asian mustard, Brassica tournefortii. Most of the desert floor was not green. From what I had seen in Anza-Borrego this spring, I was expecting more extensive green patches. However, vegetation growth in Anza-Borrego may simply be ahead of the Mojave, so it may be too early to see the full extent of greenery. I-15 was lined by blooming Asian mustard; it was fairly depressing to travel for ~100 miles and see a huge number of plants of Asian mustard as the only blooming annuals. I was hoping that it was only present along the disturbed soil next to I-15, but I couldn't tell for sure. Worse, every so often there would be trees of tamarisk, also an invasive weed. The highest concentration of tamarisk was at Furnace Creek Ranch, where over a hundred had been intentionally planted. (:-( I can't believe they haven't removed these trees there by now, to prevent their further spread in the Park. The plants immediately improved upon heading for Death Valley from Baker along SR127. The Asian mustard disappeared, and blooming native plants appeared at the lower elevations (~400-~700 feet). More of the desert was green with what looked to be mostly native plants. The road was somewhat sparsely lined with what appeared to be brown-eyed primrose, Camissonia claviformis, beginning its bloom. The flowers disappeared as we headed up to the 3,288 foot Salsberry Pass, since the bloom has only started at the lowest elevations. Most surprising of all was the appearance of a large lake of water in Silver (Dry) Lake! We were stunned at how extensive the lake was, especially since we did not notice a lot of water in Soda (Dry) Lake. We saw a fair number of normally-dry lakes on this trip, and nearly every one had a least an extensive puddle of water. But the water in Silver Lake did come from the Mojave River, which had an extensive flood in January. As we headed down from Salsberry Pass, flowers began to appear again at Jubilee Pass at ~1350 feet, just as promised in Ranger Charlie Callagan's wildflower report for 29 January. Just below Jubilee Pass, we stopped and saw a number of flowers in bloom from hairy desert-sunflower, Geraea canescens; brown-eyed primrose, Camissonia claviformis; popcorn flower, Cryptantha sp., phacelia, Phacelia sp., with an occasional desert chicory, Rafinesquia neomexicana. Soon the road was lined with hairy desert-sunflower, brown-eyed primrose, with hairy sand verbena, Abronia villosa, joining the show in profusion. Then the most-stunning display of all: a dense field of hairy desert-sunflower, almost filling the entire field of view on both sides of the road with yellow! But one thing puzzled me; Ranger Callagan's report said that "carpets of ... desert gold line the roadways". I had looked up the name desert gold in three sources, and the only desert gold was in desert gold-poppy, or desert golden poppy, Eschscholzia glyptosperma. (The three sources were Mojave Desert Wildflowers by Pam MacKay; California Desert Flowers by Sia and Emil Morhardt; and in my database of names from Calflora.) Yet there was nary an Eschscholzia glyptosperma to be seen! By the way, thanks much, Charlie, for your wonderful reports! They made my visit much more pleasant and educational. I of course especially appreciated the report listing Latin Names, since only then did I know for sure which species was in bloom. The drive to Furnace Creek revealed at most one new species with evident bloom, at least from the car. (I'm fairly good about spotting different blooms from the car, but have a terrible memory and have forgotten what species this was. On a botanizing trip, I record everything at the time in the field.) In fact, only the area near Ashford Mill had large numbers of blooms of the species mentioned above. Fairly soon after heading north from Ashford Mill, the only large number of blooms were from brown-eyed primrose, accompanied by an occasional hairy desert-sunflower, both of which were just beginning their bloom there. We were stunned to see Manly Lake, the reincarnation of the Ice Age Lake Manly, as we approached Badwater. We had expected a multiple-acre lake from the reports of a 20 inch depth. Instead, we found a multiple thousand acre lake (or so; this is just a wild guess) that went on for miles! The next morning, at the Visitor Center, I noticed a species new to me in bloom which turned out to be golden desert-snapdragon, Mohavea breviflora. Also, I had seen a lot of dead (or almost-dead) plant remnants in various areas along Badwater road, which was another species new to me. By great good luck, it was one of the few species labeled at the Visitor Center: Arizona honeysweet, Tidestromia oblongifolia. We hiked the Golden Canyon / Gower Gulch Loop because I had just read about the incredible travesty highway engineers had visited upon the ecology there, and I wanted to see the effects first hand. See the Appendix below for the story. One of the thoughts I had in mind was to return someday to begin a plant trail guide. So this hike would be a good reconnaissance trip to see what a plant trail guide might be like for a trail here. I quickly concluded that creating a plant trail guide for this trail was essentially pointless, since I was astounded at the nearly complete absence of plants along the entire route in Golden Canyon and Gower Gulch. (The return from Gower Gulch to Golden Canyon along the alluvial fan was populated fairly well by plants, just as in every other alluvial fan I saw, although once again there were only a few species present.). It was some distance from the trailhead before I saw the first single plant. There was only a handful of species in these canyons, with not many more total individuals. Even the most level places had no plants. I had never seen such a botanically-barren area before, at least since I acquired botanist's eyes in 2001. The areas I've botanized in the Anza-Borrego Desert seem like a tropical rain forest in comparison. However, I have not botanized the badlands in Anza-Borrego yet; perhaps they are equally devoid of plants. The pix online for the Anza-Borrego badlands seem to indicate a much larger number of plants, albeit still a pretty barren area. the utter lack of soil on the badlands outside of the washes. the impermeable nature of the country rock (the rock exposed at the surface), the Furnace Creek Formation, consisting of lake deposits from ~5 million years ago, from the ancestral Panamint Mountains. the young, not well-consolidated rock, which is easily-eroded. the high salt content (primarily borates) of the country rock. the scouring effects from the August 2004 and December 2004 - January 2005 storms in the washes. The reasons are probably all working together to eliminate most plant life here. Much of the country rock is impermeable mudstone; water simply runs off such a surface. The rapid runoff removes any loose particles that might begin to form soil. The low rainfall ensures that the rock surface never moistens long enough for even a low penetration rate to begin soil formation. The ease with which the rock is eroded prevents plants from gaining a foothold. The high salt content (mostly borates) makes it impossible for any plant to grow, even in areas that catch the weathered particles and begin to form soil. Finally, nearly all plants growing in the washes would be have swept away from the August 2004 and December 2004 - January 2005 flooding. The first plant specimen on the trail is desert holly, Atriplex hymenelytra, which is perhaps the most abundant shrub near the salt pan of the main Valley, and second in abundance in the lower-elevation Park only to creosote bush, Larrea tridentata. This shrub was blooming and in full fruit in many places in the park, with perhaps 5-10 specimens on this loop. I had seen it often on the previous day, but only tried to identify it after this hike. One of the next specimens I encountered was a single specimen of a peculiar sparsely-fuzzy-wuzzy looking shrub that was not in bloom. Leafing through Death Valley Wildflowers, by Roxana S. Ferris, I came across a close match which stunned me: desert bush nettle, Eucnide urens. This is supposed to have stinging hairs, but I'm pretty sure I lightly touched the plant at least once without getting stung. So either my picture-match-with-mental-image is wrong, or else I got lucky in not getting stung. The only other species I recall on this trip were a single example of what was probably devil's spineflower, Chorizanthe rigida, which I had seen only once before in Anza-Borrego, and a handful of Chaenactis baby plants. So I began looking at other information. First, pleasingly, this species was listed on Ranger Callagan's wildflower report, but the common name of goldcarpet further confused me. No way these plants, in beginning bloom, looked anything like a gold carpet! 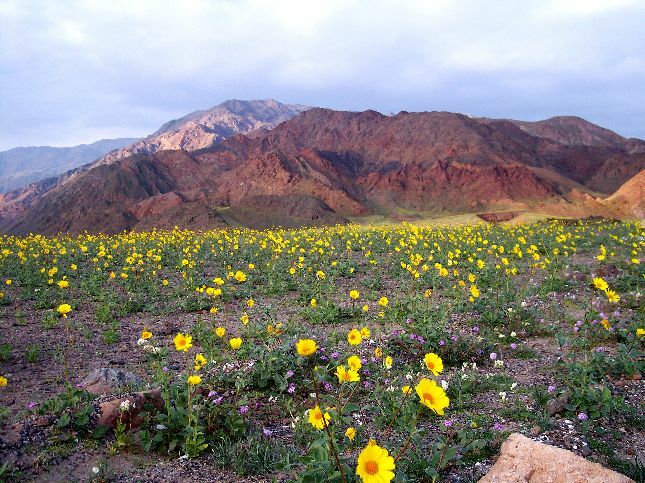 The Death Valley Wildflowers Brochure showed the spitting image of the plants I saw, with yellowish-green blooms and nary a trace of actual yellow in sight. Amazingly, the plants I saw, and pictured in the Wildflowers Brochure, looked nothing like the color picture in the JDM! There the plant is ablaze with yellow. I finally found the answer to this seeming contradiction in Ferris: plants yellow-green in flower; brighter yellow all over when fruits ripen. Now, finally confident in the identification, I continued reading and was then astounded to learn that this is a Death Valley endemic, being classified as RARE in the JDM. Ferris says It is very rarely seen, except in the best years, and grows only on the lower parts of some of the washes in Death Valley. This certainly qualifies as one of the best years. I read someplace that the record annual rainfall at Furnace Creek is 6.5 inches. So far this year, there has been almost 5 inches of rain there, ~3x the average total annual rainfall. There was a fourth interesting plant on the alluvial fan, last part of the trail, whose leaves looked like those of Lomatium dasycarpum. I suspected this was L. mohavense, since this is the only species listed for the Death Valley region in the JDM. However, the JDM says this species occurs from 1000-2000 m (3300-6600 feet), and Munz says 2000-7000 feet! This is pretty far from ~sea level, where i observed the plants. I don't have a Death Valley Plant List to check for other Apiaceae candidates. If anyone has an idea of what these plants might be, please let me know! On Wednesday, 2/9/05, we tried to check out the riparian habitat of Salt Creek, but the road was closed. We continued to the dunes, and hiked to the Star Dune. I was amazed to see many popcorn flowers, Cryptantha sp., growing robustly in the lower dunes, but they were not yet in flower or fruit to try to identify them. It would be quite interesting to me to learn what species these are, to know if one of the usual suspects can grow in such a different environment, or whether this is an unusual species confined to such an environment. We drove out the northwest route, and I only saw two notable plants in bloom from the car, a paintbrush (only two plants!) and a few bush daisies (~Encelia), both in the Argus Range at about 3000 feet. I was stunned to see both the San Gabriel Mountains and San Bernardino Mountains clearly from this point, 110 miles away, despite looking south into the haziest part of the horizon (due to forward-scattering from the sun)! Overall, despite this being a primarily non-botanical trip, I was pleased with the botany I got out of it. This report is actually a botanical story, but bear with me while I go through the geology behind the botanical story. In 1941, higher workers diverted the Furnace Creek Wash drainage into Gower Gulch at Zabriskie Point. They did this in order to prevent damage from future floods to SR190, the Furnace Creek Inn, and the water-collection network that delivers water, stolen from springs supporting native plants, to Furnace Creek properties below Zabriskie Point. One wonders whether they bothered to consult any geologists before deciding to do the diversion, because, ironically, this diversion effectively ensured that the part of SR190 above Zabriskie Point would eventually be destroyed. The story of this whole mess, which is actually an experiment of great interest to geologists, is told in Sharp and Glazner's Geology Underfoot in Death Valley and Owens Valley, Chapter 11. In that 1997 book, they reported that any competent geologist could have predicted disaster to both SR190, and to the Badwater Road, from this diversion. In addition, any competent botanist could have predicted disaster to native plants in both areas. 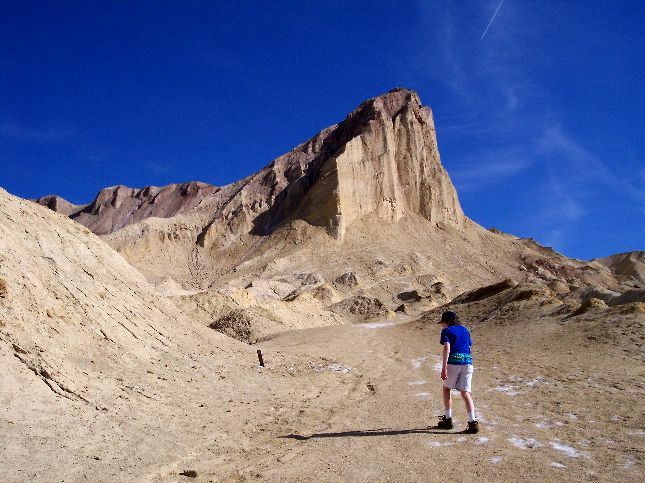 First, diverting Furnace Creek Wash into Gower Gulch gave water a quicker, steeper route to the Valley Floor. This isn't a minor change; the gradient in Furnace Creek Wash at Zabriskie Point is 185 feet per mile; in Gower Gulch the gradient is TEN TIMES higher! Sharp and Glazner report Geophysicist Dan Dzurisin estimates that the potential incision might be as much as 150 feet, which would almost certainly undermine SR190, which might then have to be re-routed. This prediction isn't academic, as showed by the August 15, 2004 flood which took out a large chunk of SR190, resulting in its closure well into 2005 due to the need for extensive reconstruction. Second, Gower Gulch had developed as a response to water draining from a 2 square mile area. With the diversion, it was suddenly being eroded by water from a 170 square mile area! In addition to huge effects all along Gower Gulch, this vastly increased discharge rate has eroded the head of the alluvial fan at Gower, and created the beginnings of a new alluvial fan lower down. Ironically, yet again, the new alluvial fan is now growing over the Badwater Road. Every storm now deposits additional debris on Badwater Road, which then has to be repaired. Botanically, this diversion will significantly lower the water table in lower Furnace Creek Wash, and raise the water table in lower Gower Gulch. This may cause the extirpation of extensive stands of native mesquite bushes in lower Furnace Creek Wash, if their roots can no longer reach the ground water. Sharp and Glazner report that it is entirely possible that this diversion might have happened naturally some centuries in the future. However, it is possible that any natural diversion would occur slowly enough for plants in both areas to adapt to the changes. In fact, even the human diversion was not totally effective; some of the 2004 flood jumped the diversion and flooded Furnace Creek Wash as well. Sharp, R.P. and Glazner, A.F., Geology Underfoot in Death Valley and Owens Valley, 1997, Chapter 11, A Diversionary Tale. Troxel, B.W. (1974). Man-made diversion of Furnace Creek Wash, Zabriskie Point, Death Valley, California. California Geology 27: 219-223. Beaumont, P. and T.M.Oberlander. (1973). Litter as a geomorphological aid--Death Valley, California. Geography 58: 136-141. 3 dimensional View of the incised channel in the Gower Gulch fan below the mouth of the canyon. I thank Janet Westbrook for comments on this report; specifically the later bloom time of the Mojave Desert; the specific salt composition of the Furnace Creek Formation; information about the Mojave River flooding of January; the probable id of Encelia; the vast resurfacing of washes and alluvial fans that occurred from the August 2004 and December 2004 - January 2005 flooding; and the clarification added on the average erosion rate.